Yay! It's almost spring! I can hardly believe it! And while the calendar says it's only about 3 weeks away, here, in the Midwest, it will be another 2-3 months before we actually feel like it's spring. During these dog days of winter, the house seems especially dark...we are all experiencing some heavy-duty cabin fever, and we are just generally in a funk. 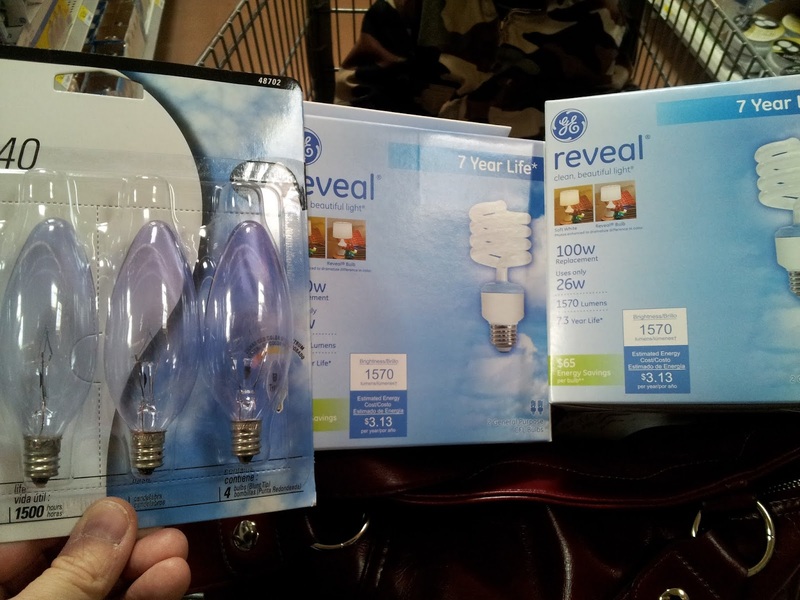 So, when I got the opportunity to do a mini-makeover in my home using GE Reveal Light Bulbs, I jumped at the chance! How fun to brighten things up indoors even if we're still in the dark cold outside! I decided we needed to change things up a bit in our family room. It's definitely the darkest room in the house. We live in a split-level home, so our family room is half-way underground...any light we get is dampened some by the ground outside and our only real view out of our family room windows is the grass in our backyard or the lower 2 feet of our neighbor's home...weird, right? So when I received my GE Reveal Light Bulb coupons in the mail, I grabbed Tyler (my 5-year-old) and we darted out to Walmart to get started. You can view our entire shopping trip here on Google+. I was so encouraged by the photos on the front of the Reveal packages...they show how you can really transform the light just by changing out the light bulb...definitely what we needed. AND, because a 100W Reveal bulb uses only 26W (!!!) you save energy and money! Sounds like the perfect deal to me! And get this...the GE website has a great energy smart® Calculator you can use to find out exactly how much you can save! These photos are COMPLETELY UNRETOUCHED. I wanted to give you an idea of exactly the difference these bulbs made. Now...keep in mind that I am not a professional photographer (ahem), but you can definitely see the difference. The shadows are so much more heavy and prevalent in the "before" photo...see how the lamp lights up only the area right around it? Dark and uninviting. BUT, the new bulbs and the new lamp really make such a huge difference! The lamp lights up the entire wall and space around the easy-chair. And it also lights up the blue couch next to it! And folks, these photos really don't do the space justice. The light from the Reveal bulbs is not so yellow, it's a more clear, more true light...and I love it. Beautiful light, right? Love love love it. Here's the before and after from the other table lamp in the room (please ignore the Lego mess/monstrosity/ever-present craziness on the table...). Again, notice the different color of the light...and just how much light is spread over the coach and surrounding area. I wish I could invite you all over to see for yourselves...it's really quite lovely. OK...can you see that difference??? I am still astounded. And that's just from changing the little lamp bulbs I had in place with 40W GE Reveal light bulbs. So awesome...I may even be able to take photos of my work after the sun goes down! Now that would be a miracle. So what do you think? Did you ever imagine that just changing up a few light bulbs could really change the look and feel of a room? I have to admit that I was a skeptic until I saw it with my own eyes. So, why don't you give it a try? Grab some new GE Reveal Bulbs and add them to the lamps you already have...or buy something new and use them there! Either way you're sure to improve the looks of your space. Not sure exactly what lighting would be right for your home? Well, click here for some help from the experts at General Electric. What a great difference!! Who knew light bulbs would be that different in lighting! I definitely need to change out my bulbs in my craft space. That's such a difference! Wow, what a difference between the photos! 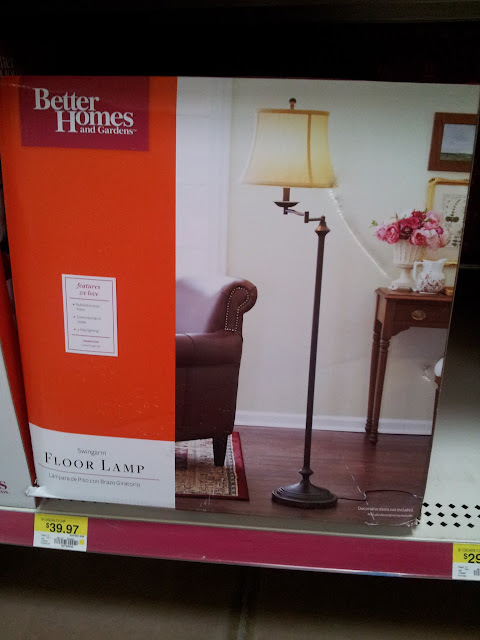 I love the lamp you picked up, it's so classy and pretty!